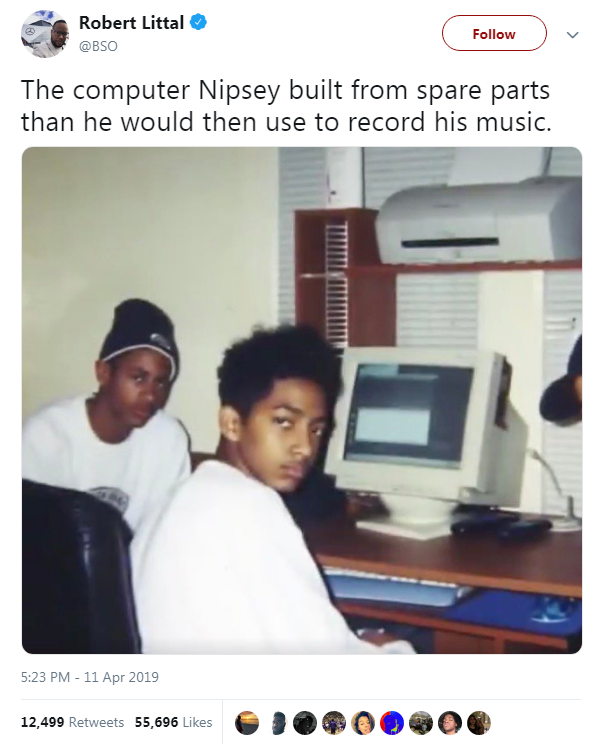 Nipsey Hussle built a computer from scratch with spare computer parts he found, and then recorded his songs on it at age 12. The photo of the computer he built has been uploaded online. Nipsey Hussle brother Samiel revealed that Nipsey built a computer by himself with parts he found. During the ceremony, while giving his speech Samiel spoke about Nipsey coming home one day with a “bag full of computer parts.” He says Nipsey only had separate parts, and he wasn’t interested in what Nipsey was saying at the time because they were supposed to be cleaning their room. Samiel says Nipsey put the parts all over the floor and started building, and he thought to himself that his brother wasn’t about to build a computer right then and there in their room, as he believed building a computer was something among “Rocket science”. Samiel says that over the next few weeks Nipsey started bringing computer parts home, while he studied various computer magazines and books regarding computer hardware and software. One day, Samiel came home and the computer had been fully built and operational. Samiel told the audience that he was amazed, but telling them that wasn’t the end of the amazement. Nipsey had recorded some music on it, and let his brother listen to the music he recorded on that very computer. Orlando Brown has Checked into Rehab for Substance abuse and Mental Health. San Jose to start paying Homeless people $15 an hour to pick up trash around the City. Tamar Braxton has been molested as a child multiple times by both sides of her family. Micheal B Jordan is Being Considered for the role of SUPERMAN, replacing the actor Henry Cavill.